Follow us in our quest to settle in the South of France! 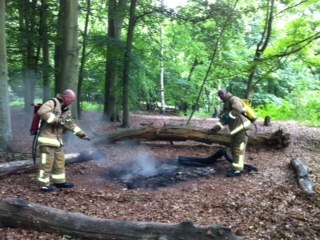 Walking in the woods this morning with some fellow dog walkers we came across the remnants of someone’s bonfire! Whether they had camped out in the woods overnight or just had a cooked breakfast I’m not sure, but they left and hadn’t extinguished the fire completely. After much stamping on logs and embers we realised that it was still very, very hot and in the centre when we dug down with a stick it was glowing. Now apparently if you have a fire like this the heat that is underground can travel and catch a root of a tree and then flare up somewhere else. Question: Do I ring the fire brigade … Answer: Of course. Now I don’t know if you were educated like me but we were taught to dial 999 ONLY in case of an emergency, by emergency I imagine, flowing blood, men with axes, towering infernos … I can’t tell you how unsure I felt as I dialed those 3 numbers and the voice answered, “What’s your emergency?” I felt like a fraud! There was no one choking to death, in fact there wasn’t even a flame! 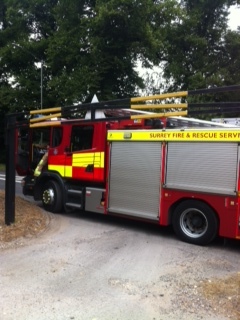 I explained the situation and was told to go to the nearest car park where I could meet the Fire Engine!!! I told them I’d be the lady with white hair and little black dog!! Well I couldn’t think of a better way to describe myself!! The engine turned up and the firefighters put on back packs full of water (including a wetting agent) I assume that makes water wetter!!! I then led the firefighters back to the bonfire … only this time I was walking backwards, the ferns had grown and I lost my bearings!! Don’t worry we did get there eventually but I did feel a bit of a fool!! (to say the least) I stood back and watched as these big burly firefighters tackled the smouldering patch, I chatted with the ‘boss’ and he said I’d done the right thing. Even though deep down I knew it was the right thing to do, I can’t help but feel a little foolish! On another note, poor little Charlie is feeling a little sorry for himself, one of his friends took a nip out of his cheek!!! So this is the result.. This entry was posted in Daily life, Dogs, England, Photos and tagged Dogs, Fire, Fire apparatus, Firefighter, Photos, Woodland fire, Woods. Bookmark the permalink. ← Ooh I’m a guest blogger!! It is better I think to have called the fire department for something small before it gets too big. I think you did the right thing. Yes I don’t feel quite so guilty now, as a few people have said I did the right thing. Can you imagine how bad you’d feel if you’d left it alone, returned home and then saw on the news later on that what seemed like a small camp fire had consumed a forest or burned houses? You did the right thing! Poor Charlie, hope he perks up! Can’t be fun having that thing sticking out of your head! 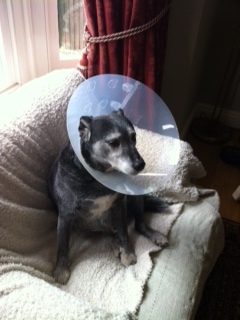 I know you’re right and I’m glad I did the ‘right’ thing, as for Charlie, he’s still wearing the lampshade, every now and then we feel so sorry for him, especially in this heat, so we remove it … then … as soon as we leave the room, he has a darned good scratch and makes it bleed again. Poor little soul – he must be so uncomfortable in this heat although he does have a fan. Not that he’s spoiled of course!! © Michelle O, Hidden Gypsy and Takingsnaps. Unauthorized use and/or duplication of this material without express and written permission from this blog’s author and/or owner is strictly prohibited. Excerpts and links may be used, provided that full and clear credit is given to Michelle O, Hidden Gypsy and Takingsnaps with appropriate and specific direction to the original content. A little, not so French culture. One Year On … living in the South of France. Family history … digging up graves! I’m an ENFJ! What are you? Can we trust personality tests? Best Laid Plans … I don’t think so!